“I wish I had that much willpower!” Or something along those lines. Let me tell you something. The idea that willpower will get you what you want is an over-exaggerated myth. Willpower might get you started, but it won’t keep you going? Because willpower, like food or fuel, is a finite resource. It depletes as the day goes on. 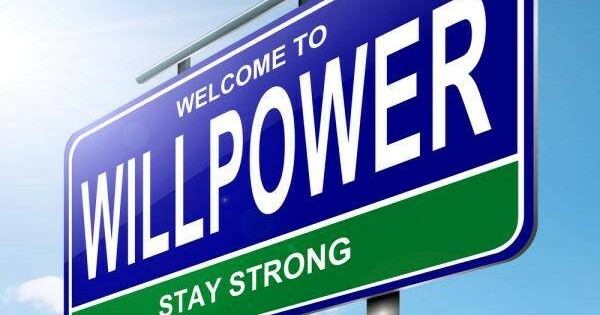 It’s one of the most replicated findings on willpower – that it runs out. And to top it all off, it’s the same resource that you’re accessing for unrelated tasks. So if you are using willpower to say ‘no’ to a second serving of food, it’s the same willpower source that you will be using to manage your short temper or ignore distractions. Willpower depletes as the day goes on. However, there is some good news. If we use the metaphor that willpower is a mental muscle, which, like regular muscles fatigue with overuse, we can also recognise that – just like muscles, which get stronger the more we use smartly with training – then our mental muscle of willpower can be strengthened. Two things have been shown to increase willpower strength. Meditation and physical exercise (both intense cardio like running and mindful exercise like yoga). And they are both great. As someone practises both meditation and yoga, perhaps that’s the reason I have greater willpower. But….. The way to lasting success, in my opinion, is not having a reliance on willpower for getting you through the day. You’ll need to make sure you have enough willpower for circumstances which are new to you and that you want to avoid. Such as refusing the advances of Halle Berry (or Angelina Jolie, or whoever floats your boat) even though you’re in a committed relationship. But if you think that you can use willpower day to day just to say no to that Vente Mocha Chocca latte from Starbucks or willpower to stop using Facebook at work on your smartphone, you’re wasting your time. What happens is that you will then deplete your stores of willpower with just combatting the daily grind of life. And by the evening, you’ll be going full out on that booze, cake and social media frenzy. Or whatever your current vices are. Create and form good habits. Habits are the bedrock to it all. Once something becomes a habit, it no longer requires much energy to do. And therein lies the secret. And the conundrum. Bad habits are easy to form and hard to break. Good habits hard to form and easy to break. So how to form them? I’ll leave that for another blog post, but in the meantime, the first video in the series of free videos from my other site, will take you through a framework to identify and correct bad habits. You can access that here.